Minister of State for Road Transport, Highways and Shipping, Pon. 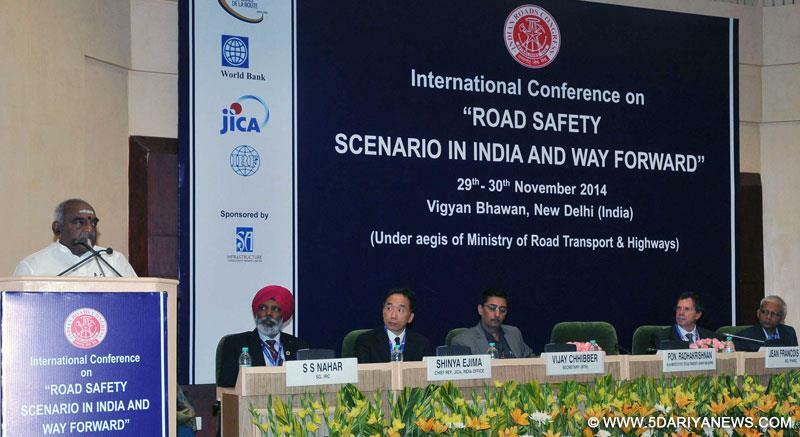 Radhakrishnan inaugurated an international conference on `Road Safety Scenario in India and Way Forward’ here today. The two-day conference, organized by Indian Roads Congress (IRC), would provide a common platform to all stakeholders to discuss and identify the constraints and best available practices around the globe. It would attempt to recommend an innovative, sustainable and implementable Action Plan to prevent road accidents and ensure safety to all road-users. In his inaugural address, the Minister expressed his deep concern about the high rate of road accidents in the country. He said, “it is quite alarming that India constitutes about 10% of the total road accident fatalities in the world. The road accident fatalities in the country constitute 80% of the total traffic fatalities.” Since the socio-economic cost of road accidents is estimated over 3% of the GDP of the nation, there is an urgency to spread road safety awareness among the people of all sections of the society, he added. Drawing attention towards the measures to reduce the level of road accidents, the Minister said, `strict enforcement of speed control, mandating the use of seat belts and helmets, ensuring fitness of vehicles plying on roads and separating lanes for non-motorist vehicles are the need of the hour.” Ministry of Road Transport and Highways has been taking a number of steps to enhance level of awareness about road safety including programmes of road safety training, driving instructions and traffic regulations, the Minister said. He further said that `the Ministry has taken a landmark initiative to provide appropriate medical care to accident victims during `Golden Hour.” A toll free phone number, 1033, has been installed for reporting of accidents, he added. The inaugural session of the Conference, comprising of five technical sessions, saw presentations from the representatives of the World Road Association (PIARC) and Global Road Safety Facility (GRSF) of the World Bank. Secretary, Road Transport & Highways, Shri Vijay Chibber, Secretary General, PIARC Mr. Jean Francois Corte and Chief Representative, Japan International Cooperation Agency (JICA) at India Office, Mr. Shinya Ejema were also present on the occasion.